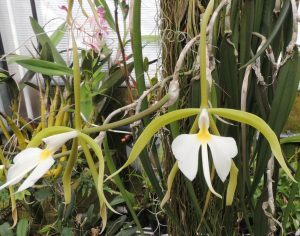 Epidendrum parkinsonianum is a species we are particularly fond of since finding it in the volcanic mountains of Costa Rica, where it grows at around 1200m altitude, hanging on the trunks and main branches of trees near rivers. This habitat surprised us as we had assumed from the thick leaves that it needs a dry bright environment. 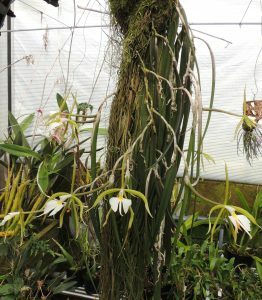 Moving the plant into cool shady conditions in our Cool Americas section (minimum 12C) in 2007 has resulted in much better growth and heavy flowering. We keep the plant damp throughout the year. The plant was awarded an cultural certificate in 2017 and awards at Paris in 2018. It has slightly fewer flowers this year, as we have taken a few divisions from it to propagate for the future, but it is looking fantastic and will once again be a real feature at the London Show next week.